NintenGen: The Wii countdown clock revealed! 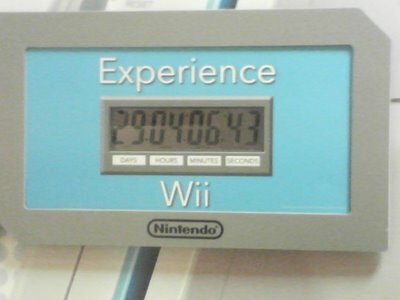 The Wii countdown clock revealed! Less than thirty days for the Wii and Nintendo is letting us know about every second until the day comes. Most Gamestop's should be getting these either now or soon. Nice looking clock and thanks for the support with my contest. No problem. Someone by the name of Twilight Princess posted a comment here yesterday and it linked to your site. I didn't know you had others helping you on the site. Is that your wife or someone else? Mommy blog? So you have kids too right? Thats awesome. Keep up the great work. Yes I have a 16 month old daughter. Her name is Kathryn. She is a blast. I'm training her to play sonic on the dreamcast right now. I have a junk dreamcast controller and I'll let her pretend she is playing with me when I'm getting a craving for sonic. When she gets older I'll let her play for real but she is of course won't be allowed to play all day long. I as a kid was limited to how long I could play. I hated the rule but I love my parents for it now. There is more to life then video games as I'm sure you know but, they are one of my favorite past times even though I enjoy many other activites. Sorry I didn't mean to be so long winded have a great day.